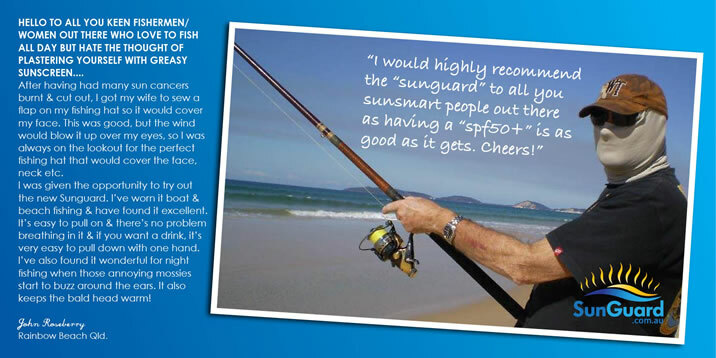 SunGuard - The Aussie-made Multifunctional Tubular Headwear with UPF 50 Sun Protection. Over-exposure to solar ultraviolet radiation can cause sunburn, skin damage and an increased risk of developing skin cancer. Clothing provides one of the most convenient forms of protection against UVR, but not all garments offer sufficient sun protection. Arpansa, the Australian government radiation testing body, informs people both UVA and UVB protection is necessary to prevent skin cancer. Arpansa introduced the UPF rating that all Australians know. SunGuards have been designed in Australia, and are fully manufactured in Australia, using all Australian-made materials. Our durable fabric tested in Australia, under exacting standards, to ensure maximum protection, has a hydro finish for maximum breathability and moisture wicking capabilities, which provide optimum cooling benefits to the wearer. They are perfect for Australian conditions, offering sun protection, comfort and cooling. SunGuard is the only choice if you care for skin cancer protection. But there is more. Wearing this multifunctional tubular headwear will also protect you from the wind, and even annoying insects. You can feel cool n safe while doing all your favourite outdoor activities. The SunGuard is one of the most versatile headwear garments you can find. This multifunctional headwear is a Performance Headband, Face Mask, Cool Tube, Beanie, Head or Neck Gator, Doo Rag, Cancer Hairloss Cap... to name a few of its multifunctional uses. The SunGuard was designed after constant requests from fishermen, kayakers and water enthusiasts for a SPF 50 product to wear out on the water for many reasons. People requested a product to reduce glare so they could see the fish better, protect against stinging water drops, guard against windburn, absorb some engine noise in a moving boat and save their skin from sunburn when they were out all day. But the SunGuard multifunctional tubular headwear is designed for a wide range of outdoor pursuits, not just water activities: everyone from outdoor workers, wildlife excursionists, bikers, golfers, gardeners, runners, cyclists, hikers have benefitted wearing this unique all Australian product. One size fits all. It is easy to wash, dries fast and fits in your pocket. Personal Cooling Products understands the need for something stylish, comfortable and affordable when people suffer hair loss as a result of chemotherapy. Many report back to us that the SunGuard is their favourite Cancer Chemo headwear because it can be worn in so many ways, is cooling and feels so soft.